Scooper - Technology News: Copa America: Which countries are most competitive off the pitch? 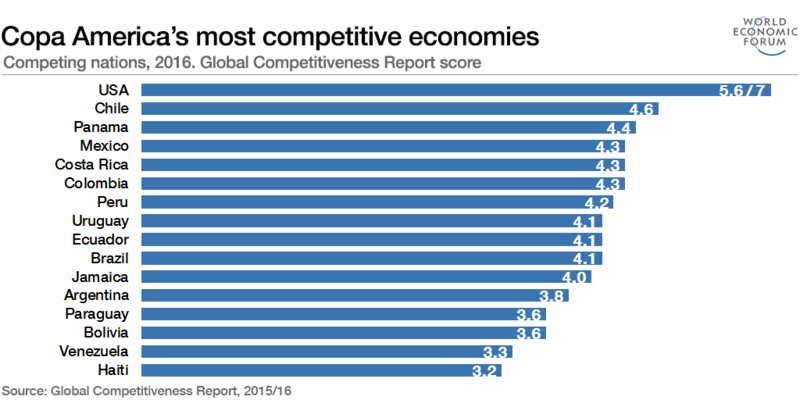 As 16 teams aim to prove themselves the best on the pitch, which countries’ economies are most competitive off the pitch? Using data from the World Economic Forum’s most recent Global Competitiveness Report , we ask: which economies are topping the group in Copa America? The host comes out on top, with a score of 5.6 out of 7. The US’s high score saw it come third overall in the global rankings. The report highlights major strengths as “exceptional innovation capacity, large market size and sophisticated businesses”. The silver medal goes to Chile, which was 35th overall. The Chilean economy was Latin America’s most competitive. A number of strengths have driven this: solid institutions, well-functioning financial markets and technological readiness. Just behind, in third place, is Panama. The small Central-American nation featured especially highly in the financial-market development pillar. The majority of Copa America economies are facing a challenging environment . GDP growth is falling across much of the continent, inflation is high from Venezuela to Argentina, and there is continued concern over job creation and inequality. With the Global Competitiveness Report providing an insight into productivity and prosperity, it offers a comprehensive look at national economic competitiveness. However, the question remains: which economies are set to convert opportunities into goals, and which could be wrongfooted by defensive lapses?